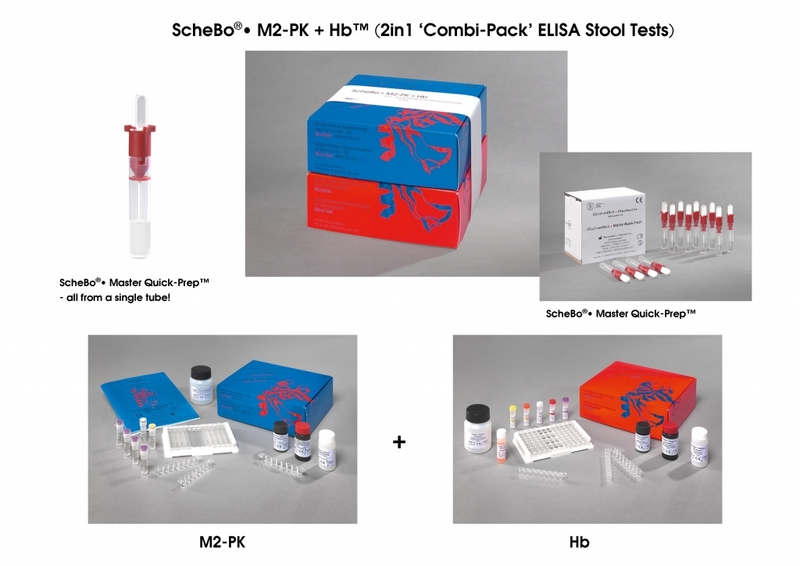 … The ScheBo M2-PK Stool Test ELISA is now also available in a ‘Combi-Pack’ to detect the enzyme biomarker M2-PK in parallel with immunological faecal occult blood (iFOBT)! The enzyme biomarker M2-PK has been identified as a key enzyme in the development of polyps and tumours. M2-PK quantification (direct method) is completely independent of the presence of blood in the stool. The immunological faecal occult blood test (iFOBT), which detects human haemoglobin (Hb), is a totally different method which relies upon the presence of a source of bleeding into the gut (indirect method). Therefore, by combining M2-PK and Hb testing, bleeding as well as non-bleeding colonic polyps and bowel tumours can be detected. And another advantage – combined testing of M2-PK and Hb can be done using just a single sample extraction device, the new ScheBo® • Master Quick-Prep™. This innovative ‘universal’ Master Quick-Prep device can also be used for all other ScheBo Biotech faecal ELISA tests.